Following a rough week, Texas moved down to the No. 13 spot in the D1Baseball poll on Monday. Texas (17-10) was ranked ninth last week and it did record two wins over Arkansas and TCU. 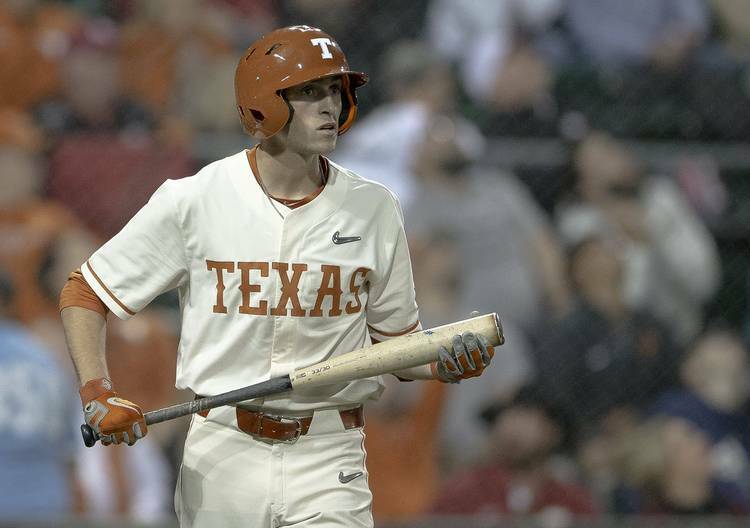 The Longhorns, however, opened the week with an 11-4 defeat against the Razorbacks. UT then fumbled away two late leads in its 3-2 and 12-8 losses in Fort Worth. Ranked 11th and 22nd last week, Arkansas and TCU snagged the No. 8 and No. 19 rankings in this week’s poll. An 8-inning, 7-strikeout gem from @bryce_elder13. 9-for-14 with a 3B, 4 RBI, and 5 R over the weekend for @erockken21. Despite UT’s losses, the Big 12 still honored sophomore Bryce Elder and freshman Eric Kennedy as its pitcher and player of the week on Monday. Elder struck out seven Horned Frogs over an eight-inning no decision on Friday. In addition to driving in four runs, Kennedy had as many runs as outs (five) in the TCU series. This marks the second time that Elder has been named the Big 12’s top pitcher, while Kennedy had previously been named the conference’s newcomer of the week. Texas has four non-conference games on this week’s agenda. UT will meet Incarnate Word (15-9) at San Antonio’s Wolff Stadium on Tuesday. This weekend, Xavier (8-14) and Texas will play three times at UFCU Disch-Falk Field.